The two seem to go together like peanut butter and jelly. I remember when I got my first bicycle. It was my Birthday and, although I cannot remember my age at the time, I remember the bike as if it were yesterday. 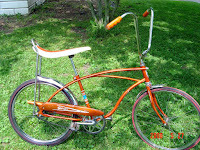 The bicycle was metallic orange with a matching vinyl banana seat. A tall chrome sissy bar held the seat along with extended chrome handlebars for additional coolness. The front tire was smaller than the back tire. The back tire was a big fat slick covered nicely with an equally fat chrome fender with a flare on the end. My bicycle was the JC Penney model of the popular "Schwinn Stingray" minus the multiple speeds with the big gearshift along the center bar, right in the "nut crunching" zone. I don't think my parents could affort the actual Schwinn, and I was just as pleased with the JC Penney knock-off. I was a kid and don't think I would've known the difference. Anyway, I don't think that we were so much poor as we were spirtitually challenged. By "spiritually challenged" I mean that between my Father's workplace and our home was the Wigwam Tavern. The place provided an insurmountable obstacle for my Father on a friday night because they would cash his paychecks as long as he stayed the night and drank his fill of the "spirits" they offered. But, again, that's another story. Anyway, I literally rode the wheels off that bike. I remember countless times pushing my bike up a steep hill only to turn the thing around and ride it to the bottom again with my whole body crouched below the extended handle bars in an attempt to break the land speed record. I spent numerous hours on that bike. It was my whole life between my "thinking I'm Grizzly Adams" phase and my latent discovery of girls and cars. Because I rode the bike so much, I also spent countless hours fixing the bike. I sometimes fixed the bike even when it did not need fixing. I'm sure you all know that I mean, turning the bike upside down and testing the pedals and brakes. I think most folks call it "making ice cream." How does bactine fit into all this? Enter my Grandma, the bactine queen. I know it's not a very nice name and I will apologize to my Grandma now for the slander, may she rest in peace. I can say this much. Bactine, although advertised as painless, stung only slightly less than Mercurochrome. Remember that stuff? It was like Hell in a bottle. The bottle even came with a handy little glass rod that would concentrate the hell onto one's wounds as it was rubbed in. Even though I feared Bactine more than death, that fear did not stop me from trying my best to show off for my Grandma every time she would visit. On one such visit, I wanted to dazzle my Grandma with my daring in a death-defying jump over a new speedbump my father had installed in the driveway. The bump was actually for drainage but, nonetheless, it provided a perfect launching pad for my planned stunt. In preparation for the stunt, I had removed my bike tires, put them back on, and tightened the chain and all the bolts on the bike. There was really no need for this maintenance but it seemed the right thing to do. Isn't that what Evil Knievel did? Oddly enough, I don't remember doing any real maintenance like lubricating the chain. The moment had arrived. I had called everyone outside to view my moment of brilliance. 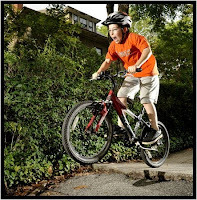 I remember pushing my bike up our driveway because the hill was too steep to pedal a one-speed bike up, setting myself up, pausing for effect, and pushing off down the hill on a dead course for the speed bump. I executed the jump perfectly, pushed off hard just as the front tire hit the small raised section of asphalt over the concrete driveway. Everything seemed to switch to slow-motion while I was in the air. I saw the astonished looks of my entire family, and most of all, my Grandma, as I sailed through the air, at least five feet above the ground. As I looked back out in front of my airborne bike in preparation for what should have been a spectacular landing, I noticed something ... odd. The front tire of my bike was rolling along in front of my bike. It was about ten feet in front of my bike. I knew at that moment, the landing was not going to be pretty. I leaned back on my vinyl banana seat until my backside was pressed painfully against the sissy bar but it did no good. The landing was, in fact, not pretty. As soon as the front forks of my, now wheel-less bike hit the concrete, I was catapulted over the high, chopper-style handlebars and directly to the driveway below. I didn't even feel the pain until my body had come to a complete stop. Of course, in true young boy fashion, the first thing I did was check to see if anyone saw the terrible landing. Who was I kidding, they all saw it, and all my cool points were gone. 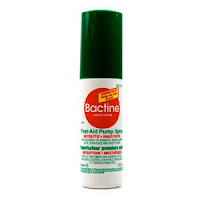 Then I saw something that scared me more than the loss of cool or even the bleeding raspberries I certainly had over the entire front of my body - my Grandma's hand was coming out of her purse and in it was a small spray can of Bactine. I shuffled to my feet and started pumping my legs as fast as I could, running from the Bactine queen. Running was a bad plan. everyone knew I would come home eventually. Grandma finally caught up to me and sprayed me down. That's when the crying began. I never forgot that day. I never forgot that bicycle. But I forgave my Grandma before she was even done spraying me with that evil-in-a-can. Why? because I knew that she did what she did out of love. So, sure, sometimes love hurts. But, it's better to be killed with kindness then to be uncared-for or unwanted. I still consider myself fortunate for having such a caring Grandma. Mom called it "The Wiggy." Hahaha. Great memory, Jim. I don't recall that incident. Grandma was a rainbow of light in our family, wasn't she?